Spring is my favorite season thanks to all the lovely flowers that are blooming right now! They’re a welcome sight after several months of cold winter weather. 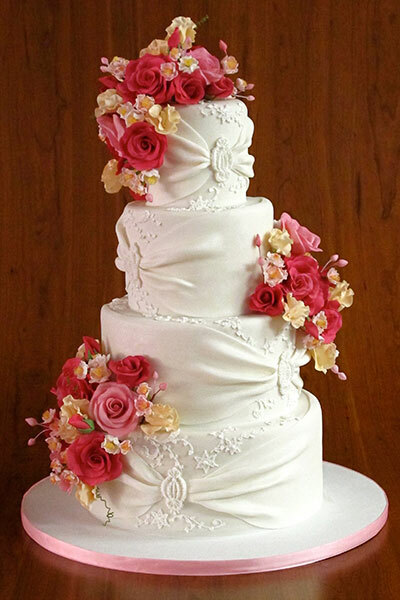 Today’s wedding cake is the perfect springtime wedding cake thanks to the abundance of lovely pink roses. I love the elegance of this cake too. The fondant bands on each tier resemble a wedding gown and they’re “gathered” by sugar brooches which really adds to the overall elegance. The cake is gorgeous without being too much. The bright pink blooms give it the right amount of pop too. And you could always use another color for the flowers. I’d love to see deep red roses too. You can find this springtime cake here. It was created by Elegantly Iced.